Last week I had a tough week. Part of my job responsibilities are customer-service based, and it seemed like everyone last week had some kind of gripe or complaint. WHAT'S THE DEAL, PEOPLE?? Maybe all these Chicagoans are cranky from staying up late to watch hockey. (They aren't as hardy as us Canadians- they only tune in during the play-offs.) Either way, it was tough. It's hard to remember to stay positive, and not to let other people's bitterness in. Pip pip! After a week like that I am happy to come home at the end of the week, roll up my sleeves, and do something simple and easy with a high payoff. 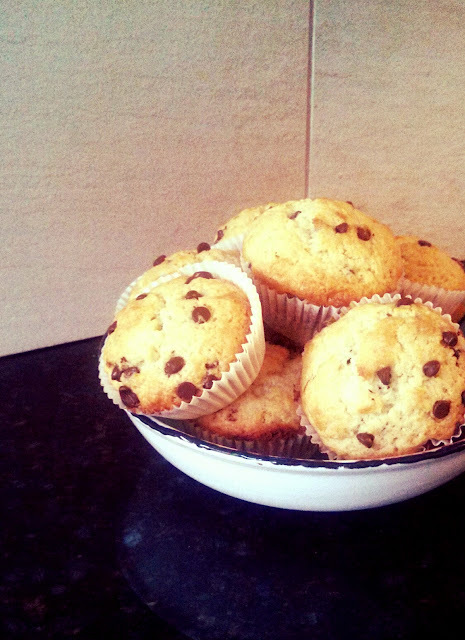 I've been making these muffins since I was little, and they are the easiest and most adaptable recipe in my repertoire. Make them banana, choc chip, apple cinnamon, blueberry, whatever. Make them healthier by swapping out the oil with banana, the flour with whole wheat, cut the sugar and add nuts and seeds. Really the possibilities are endless. add in of your choice (coconut, blueberries, apples and cinnamon, chocolate chips, shredded carrots and raisins, etc). Stir together dry ingredients. Make a well in the centre, and stir in the moist ingredients just until wet. Do not overmix. Bake at 400 degrees for 20 minutes. Chulent is not so glamorous. I tried to compensate with a glamour shot of my crock pot. See below. About two years ago I became a vegetarian, and about half a year ago I came up with my perfect combo for a vegetarian chulent. For the uninitiated- chulent is usually a meat stew that is cooked in a large slow pot (or a crockpot). It is made on Friday, and cooks until Saturday, at which point it is eaten for the Sabbath lunch. Although people are sceptical about making a meatless chulent, I think this is a winner. Try it, let me know what you think. 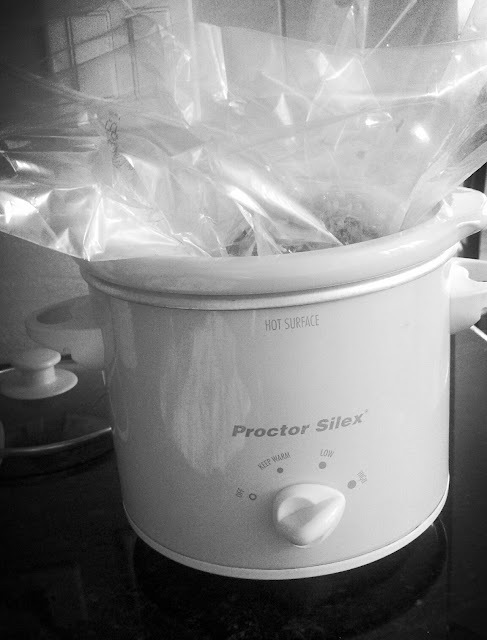 ** note- as you can see from the picture, I use a small crockpot. If using a large crockpot, double or triple this recipe. Put oil into the bottom of the crockpot. Add remaining ingredients. Add enough water to cover plus half an inch. Cook on high for 12-17 hours. There's a certain zen that comes with baking bread. You really have to trust the process that the flour, water, and yeast that you dump into a bowl is going to amount to something. At the beginning the dough looks like a shaggy mess, but with patience and a little bit of elbow grease you can really make something special. 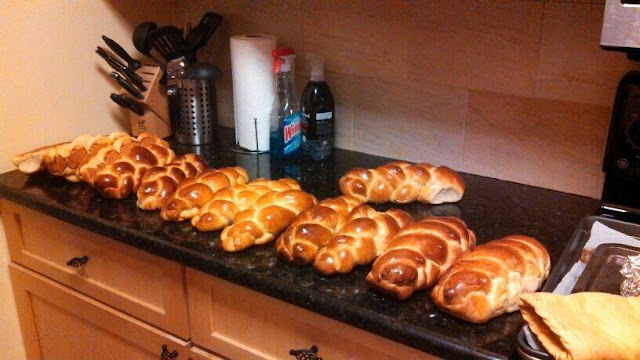 Last week I tried out a new recipe for challah. 16 challahs later... I had some sore shoulders from kneading! At my office, when you order files from the archives, if it is more than one or two files then they arrive in cardboard boxes. As I was nearing the end of my eleventh hour at work yesterday, I was suddenly hit with a wave of inspiration. Why not prop my computer and keyboard up on those boxes to make a standing workstation? Genius! I mean, I thought it was genius at the time. When I arrived at work today I rolled my eyes at yesterday Leah. At this point I've been standing for about four hours, my back hurts and I'm pretty cranky. I can't quit yet. One of the lawyers in my office downright challenged me to stand all day by saying "Ha! I'll see you sitting in under half an hour!" Shows him. I definitely have more concentration for the work that I have to do, but on the other hand I feel pretty stupid checking my facebook standing up, and I've had to explain why I'm standing to about thirty cynical lawyers. Either way, check out this blog post on my new favourite blog for a nice analysis of the benefits of sitting (varicose veins, more tiring) vs. standing (improved health, concentration, and longer life) at work. If I had remembered this morning that I did this to my desk last night then I would have worn more comfortable shoes to work today. Maybe I'll remember for tomorrow. Next project- big blue exercise ball instead of a chair. Granola and Hello Again. Long Time No Speak. It has been such a long time since I've posted! Wow. Many times over the past few months I have tried to start writing a post and I've trailed off somewhere in the middle of the first paragraph, leaving a string of half-written, half-baked posts behind me. Dear readers, if there are any of you who still visit my blog, please let me explain to you why I have taken a three month break from my blog. I started work in September at a large-ish law firm here in Tel Aviv. In Israel, before being allowed to take the bar exam, potential lawyers must complete a year of articling. I've been giving so much to my job, with its crazy eleven hour work day, that I just have not had it in me to write at night or on the weekends. It's pretty much consumed 90 percent of my waking hours. The thing is, this blog post is a small victory for me.It took me about four months of work, but I think I finally got to the point in my year where I'm managing to strike some sort of a balance between me and my internship (Leah 1, Intership 0). Either way, I miss baking and blogging- so here is the last thing that I baked. This recipe comes almost straight from allrecipes.com with a few minor changes (its called Megan's Granola. I don't know who you are Megan, but you've really added to my quality of life. Thank you.). I've had it for brekkie almost every day for a month with yogurt and its delicious. Hope you give it a try! Oh- and fyi this recipe makes TONS. Don't say I didn't warn you. 2 cups raisins or sweetened dried cranberries (or any dried fruit! I love dried cherries in this). Combine the oats, wheat germ, oat bran, sunflower seeds, and nuts in a large bowl. Stir together the salt, brown sugar, maple syrup, honey, oil, cinnamon, and vanilla in a saucepan. Bring to a boil over medium heat, then pour over the dry ingredients, and stir to coat. Spread the mixture out evenly on the baking sheets. Two things: I love granola because it is endlessly adaptable to what you have on hand and your preferences. Change it up! Personalize the recipe to suit your tastes. After you take the granola out of the oven smush it down with a large spatula and let it cool on the pan completely- then when it cools remove it from the pan and break it up with your fingers. It will be in bigger chunks like store bought granola!